Sending up the souls of Tarsians to the heavens. Saint Elenos was the Bishop of Tarsus in Cilicia in the middle of the third century. 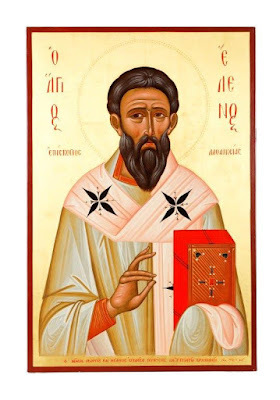 Bishop Dionysios of Alexandria informs us that Pope Stephen I did not accept communion with Bishop Elenos because he was aligned with Bishop Cyprian of Carthage. Stephen held that converts who had been baptized by heretics did not need rebaptism, while Cyprian and certain bishops of the Roman province of Africa held the rebaptism of heretics necessary for admission to the Eucharist. In his time Elenos had to confront Novationist groups who did not allow for the readmittance of the lapsed Christians that succumbed to sacrificing to the idols during the Decian and Valerian persecution. Moreover, Eleno’s name appears in two Synods held in Antioch (264 and 272), where the city’s bishop, Paul of Samosata, who was a Monarchianist, was condemned and deposed. In the second Synod, Elenos was elected president. He reposed in peace.